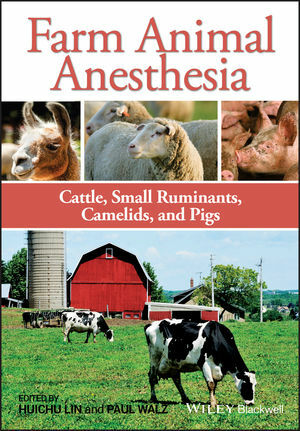 Farm Animal Anesthesia: Cattle, Small Ruminants, Camelids, and Pigs presents practical guidance on using anesthetic and analgesic drugs to prevent pain caused by surgery or disease. This cohesive resource offers complete coverage of anesthetics and anesthetic techniques in farm animals with a focus on practical applications. Providing thorough information on pain management and residues, the book also covers specific techniques for common surgical procedures and considerations for animals with pathophysiological conditions. The book includes chapters on preanesthetic considerations, anesthetic drugs, chemical restraint and standing sedation, injectable anesthesia, inhalant anesthesia, local techniques, specific procedures, pain management, residues, and euthanasia. Farm Animal Anesthesia is a useful guide for farm animal practitioners, veterinary students, and researchers working with these species. University in Auburn, Alabama, USA. Paul Walz, DVM, MS, PhD, DACVIM, is an Associate Professor of Food Animal Medicine at the College of Veterinary Medicine at Auburn University in Auburn, Alabama, USA.